Carbondale Assembly of God has been around for quite a while… over 80 years now. You may have seen us or even heard about the church, but you may not know much about who we really are. As the name reveals, we are an Assemblies of God church. With millions of members worldwide, we are the largest Pentecostal church in the world. In Oklahoma, we have approximately 500 churches across the state. Most anywhere you go you can find an Assemblies of God church. We are an evangelical church. We believe that mankind is lost and in need of a Savior. We believe salvation is available only through faith in Jesus Christ and His atoning sacrifice on the cross. We believe this is a fellowship where healing of body, soul, mind, and spirit occurs. Those suffering from the emotional wounds of religious legalism, broken relationships, and the scars of their past find healing and restoration here. This is a fellowship where the hopeless and downcast find reason to hope again. We serve “the God of all comfort” who is at work in all things for our good. Consequently, we don’t believe anyone is a “hopeless case” or a “lost cause.” Instead, we are filled with hope for what God is going to accomplish in the life of anyone who will invite Him in! This is a fellowship that values laughter! We believe God has given us reason to celebrate. While we reverence the presence of God, we believe it’s all right to laugh and celebrate with God’s family. We tend to favor family, fellowship, and having a good time over formality. This is a fellowship of peace. Surrounded by strife and fighting in the world, we believe God has called the church to be an oasis where believers find unconditional love, acceptance, forgiveness and peace. Our purpose is expressed in Worship to God. We were created to give worship and glory to God. To that end we meet in regularly scheduled services in order to collectively express our praise and worship to the Lord through prayer, praise, thanksgiving, testimonies, and singing. Our singing includes the great hymns of the church, the gospel songs that maintain a connection to our Pentecostal heritage, the more contemporary worship choruses, and choruses written by members of our fellowship, giving expression to what God is doing in this Body of Believers at this time. Our purpose is expressed in our emphasis on instruction in the Word of God. We believe the Bible to be the infallible word of God and the reference point, the guide, and the ultimate standard for all of the choices and decisions of our life. Consequently, it is essential that we know what the Word of God says and how it applies to our everyday life. We place emphasis upon teaching and preaching the Word of God from the pulpit. It is the gospel, the “good news” of Jesus Christ, that we are so excited to proclaim. Opportunities are available for age specific bible study through Christian Education classes offered on Sunday mornings. Elective classes are offered as well on Sunday mornings and Wednesday evenings. 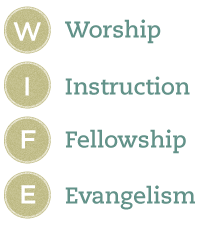 Our purpose is expressed in our emphasis on Fellowship among the members of the Body of Christ. We believe that God has gifted each member of His church and has placed that member here, strategically, to share their gift(s) with this Body. We are built up and made complete as each member of the Body of Christ shares his or her gift with the other members of the Body. To that end, we encourage everyone to become involved in some smaller group within the church. You will find opportunities for building relationships and sharing your gifts by becoming involved in a Sunday School class, a fellowship group, an interest group or a ministry group. While not everyone will have the more public gifts (like preaching, teaching, singing, etc.) everyone has a spiritual gift to share. We are less than what God intends of us to be without your gift. We need each other and the gifts that God has given to each one of us. Our purpose is expressed in our emphasis on Evangelism and outreach ministries. We believe we have been given a mandate in the words of Christ to “go and make disciples of all nations … teaching them to obey everything I have commanded you.” That great commission is for all believers, not just for preachers or professional clergy. To that end, we believe it is the responsibility of the church to train and encourage believers in personal evangelism, to provide opportunity for regular evangelistic outreach in our own community, and to provide opportunity for both home and foreign missions trips. We believe it is the responsibility of the church to address the physical needs of those in our community as well. Responding to the words of Christ that, “when you have done it unto the least of these, you have done it unto me,” we want to be faithful as a church to meet existing needs. We believe through random acts of kindness and expressions of love and concern, we are sharing the love of Christ and His message of hope with every life we touch. Come join this journey of faith and travel with us! There is much more to the life of Carbondale Assembly, but this gives you a feel for what we see as valuable and essential in the church. Each department and age grouping has its own way of “fleshing out” these values and our statement of purpose. We are not a perfect church. Rather, we are a group of people who have committed ourselves to walk together on our journey with God. We have all been recipients of His incredible and unmerited grace and mercy. Because of that, we are quick to forgive one another and to show mercy to one another. We won’t always get it right, but we are committed to the journey of faith, committed to the One who loved us and gave His life for us, and committed to one another. With that in mind, we invite you to come join this journey of faith and travel with us!